This is a BRAND NEW, Physician Quality Diagnostic Set in options of either a lined and cushioned impact resistant lightweight but tough zippered case or our hard plastic case. This unit is powered by 2 standard C sized batteries and also works with rechargeable batteries. The instrument handle utilizes a bayonet luer-locking mechanism for changing the multiple instrument heads included in the kit and is guaranteed to never wear out. The Otoscope lens is an Optical quality GLASS that is specially-coated to help resist scratches. The lens is hinged and swings out of the way if needed for foreign body removal or cleaning. 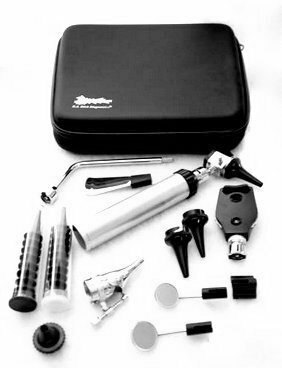 The otoscope head attachment also contains an all metal male insufflation outlet. #1 RATED, MOST RELIABLE, WORLDWIDE SELLER of RA BOCK DIAGNOSTICS PRODUCTS! Bock Medical Edition Guarantees Amazing, Fast Customer Service rivaled by none! If you have any questions about this product by RA Bock Diagnostics, contact us by completing and submitting the form below. If you are looking for a specif part number, please include it with your message.